Ask the leaders: Who is Nick Clegg? The Liberal Democrat leader could hold the balance of power in a hung parliament - but even he admits voters do not know much about him. Gary Gibbon starts his #asktheleaders profiles with Nick Clegg. There is no doubt Nick Clegg has succeeded in stabilising his party. When he took over the leadership of the Liberal Democrats in December 2007 he was the fourth leader in less than three years. But at a time of great public disillusion with the two established parties, the Liberal Democrats remain becalmed at around 20 per cent in the polls. And there are some in the party who blame Clegg himself for the failure to break through. "I think, and I feel many people do, that Nick's leadership has just been too bland, he's not been bold enough in advancing liberal values," says Simon Titley, Co-Editor of The Liberator magazine, a critic from the left of the party. From the right, Mark Littlewood, head of media for the Lib Dems between 2004 and 2007, says: "The party is in a comfort zone, it talks about risks and radicalism but it isn't very radical and it isn't very risky." "I think we've been very bold on the big issues that have dominated politics over the last couple of years," he said. "If you look at the expenses scandal, under my leadership the Liberal Democrats have clearly distinguished ourselves as a party which is much more outspoken on the big changes that are needed." But Littlewood argues that David Cameron beat him to the punch over expenses, showing greater readiness to be brutal with his own troops. And he criticizes Clegg for failing to face down his own party over the abolition of tuition fees. "My guess is that Nick Clegg would have wanted to ditch this policy if he entirely had his own way. But...he may have actually been defeated on the conference floor. So, what's actually emerged from this is a bit of a fudge." "You've got to bring people along with you," responds Clegg. "Leadership is not about having trench warfare with your own people. It's persuading them of your point of view, and then leading." He insists the abolition of tuition fees remains Liberal Democrat policy, but in phasing the abolition over six years the party is simply responding to the new economic reality. Former Liberal Democrat leader Paddy Ashdown believes Clegg has shown steady, determined leadership which leaves the party well placed as the election campaign begins. He rejects suggestions the party should be adopting a bolder, more insurgent approach. "You can have one of these things or the other," he said. "You can either be the insurgency and look to the public at a moment of very difficult judgements to be irresponsible, to be radical, to be ranting, or on the other hand, you can build on what we have spent a very great deal of time building on, which is to make the party appear serious and capable of confronting the issues that now confront us. He's chosen the second of those and I think he's right." 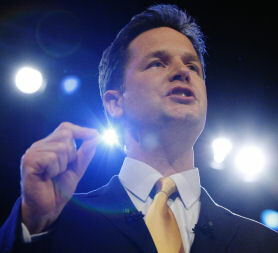 Clean cut and presentable, intelligent and personable – Clegg represents the culmination of 20 years during which the party has sought to shed its beards and sandals image; to appear grown, responsible. But critics fear the process may have gone too far. Simon Titley, who knew Clegg when he was an MEP in Brussels between 1999 and 2005, says he has only seen him truly passionate about one issue – the abolition of fox hunting, which he opposed from a libertarian point of view. "I could see that he was genuinely angry that this had happened, and it was the only time in a private conversation that I'd seen him really genuinely passionate about a particular issue," he says. "I am who I am", responds Clegg. "I'm not going to try and create synthetic emotions…I think people will know exactly who I am by the time they vote". But at a time of rising public anger and hostility towards the political establishment, many in his party will be looking to him to display a little more fire in the belly during the election campaign. Who was loyalist Billy Wright? See how many times a word is used in key speeches, and in what context.